Commercial interest in the Arctic is nonetheless high. As recently as September the Norwegian government announced that forty-two companies had applied for drilling permissions in the Norwegian Arctic. Statoil alone applied for drilling in seventy-two new blocks and will drill nine new exploration wells next year. Meanwhile, Royal Dutch Shell (finally) received permission to drill to shallow depths at the Beaufort and Chukchi wells in Alaska, US. At the end of the month, Christophe de Margerie, chief executive of French oil giant Total, broke ranks by declaring that his company will not drill in the Arctic any time soon. Environmental activists were quick in asserting that the company had finally realized the virtues of thinking green. Chief executive de Margerie, however, made it abundantly clear that his decision was a simple matter of dollars and cents. The risk of an oil spill and the reputational damage it would bring was simply too high. 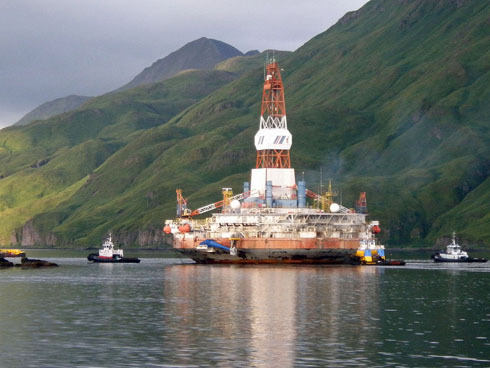 The colossal cost of drilling in the Arctic is also a problem. Shell has so far spent nearly five billion US dollars off the Alaskan coast without even gaining permission to drill into oil-bearing rocks. To yield a profit the company would need oil prices to reach at least one hundred dollars a barrel (compared to today’s eighty-five or so). The costs mainly come from meeting the safety standards that the Arctic countries set as conditions for drilling. At the moment there is no common framework to determine what those conditions should be. Standards vary country by country, according to preferences, stakes and interests. To remedy the arbitrariness that can result from this, the Swedish government has taken it upon itself, as chair of the Arctic council, to hammer out an intergovernmental instrument on Arctic marine oil pollution, preparedness and response. The Council has so far convened five times since the decision was taken at the Council’s meeting in Nuuk, 2011. When I interviewed the Swedish ambassador for the Arctic, Gustaf Lind, last month, he described the process as “developing well”. RUSI and FOI’s expert on the Arctic, Niklas Granholm, added, in a separate written interview, that intergovernmental negotiations are always hard to decipher, but on the whole shared the ambassador’s optimism. If this instrument comes into force, it will minimize the hazards of drilling in the Arctic. But it will not harmonize the conditions that must be met before drilling. This will still be determined individually by each country. What does this mean? On the one hand, there will be an incentive for oil companies to seek out those Arctic countries with the most lenient rules. The flipside is that the Arctic states have incentives to minimize regulation in order to attract investors. In other words, as little regulation as possible will be a plum policy for everybody involved. This “race to the bottom” would have some obvious implications for Arctic politics. Russia has compelling reasons to get drilling started as soon as possible, especially if it intends to maintain production at ten million barrels of oil a day and with an expensive military build-up pending. Indeed, as the Financial Times (FT) recently reported, Russia’s energy minister Alexander Novak has finally opened the Russian Arctic energy market to Western corporations — “a bold concession that makes the world’s second largest crude producer much more attractive to foreign investors,” or so FT argued. Only wary environmentalists contest the fact that the private sector will have a role to play in the development of the Arctic, and almost all national strategies already make this assumption. According to the Swedish ambassador, “private enterprise is already accounting for the lion’s share of development in the Arctic.” It is also likely, the ambassador continued, that “a large part of employment and tax revenues in the Arctic will come from private companies”. Unfortunately, discussions about private enterprise in the Arctic are almost always hijacked by pointless debates about whether there should be commercial activity in the Arctic at all. To avoid a race to the bottom, big oil must be included in the political discussion, possibly by introducing the most important companies into the Arctic Council as observers. Observers do not have decision-making powers but participate in the negotiations by giving advice and recommending options. If there is a way of getting big oil to act responsibly in the Arctic, this is it. The oft-cited risk of bringing big oil in to Arctic politics is that the Arctic disintegrates into a commercial haven. The bigger risk, however, is not including big oil – in which case commercialization will happen anyway but the Arctic might also descend into a familiar game of realpolitik, with no control whatsoever of who does what and by what standards. Including Big Oil as observers / lobbyists at Arctic Council meetings would be a grave mistake. Will big mining companies be next? The Arctic Council needs to champion and sign a Treaty to turn a large part of the Arctic into a Nature Reserve within which no resource exploitation is permitted. For mining and oil / gas extraction outside this Reserve, stringent rules need to be developed to govern such activities. Big Oil can give input to the nation members of the Council in the drafting of these regulations, but the governments should similarly seek input from environmental and local groups (fortunately aboriginal groups are represented on the Council). Total’s position to exit Arctic oil & gas activity for cost reasons no doubt included the potential huge cost of clean-up of a likely accident up there, including costs of litigation (viz. Exxon Valdez – initially set at $5 billion, reduced to just over $500 million. Exxon ended up spending $2 billion on clean-up , and $1 billion on litigation and charges. And this was not even in the high Arctic, where damages and clean-up costs would be that much greater.). Big Oil is playing with folly by focusing on the Arctic, and the Arctic Council is not the forum for it to pursue its case.